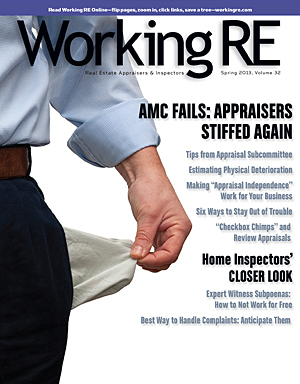 You’ll find two issues, full of valuable content exclusively for home inspectors, posted online at WorkingRE.com. Stories include: Examining Agent-Inspector Relationship, Staying Safe Out There, Manufactured Homes: One that Almost Got Away, In Search of Perfect Home Inspection, Playing “Not Readily Accessible” Inspection Card, Expert Witness Subpoenas: Don’t Work for Free, Reducing Liability: Setting Proper Expectations and much more. The 2013 AMC Resource Guide has over 200 verified AMCs listed, with the first 50 sending over 90% of the author’s work. Expand your business and find the AMCs that pay fairly and know how to treat an appraiser like a professional. You control who you work for instead of the other way around. The 2013 AMC Resource Guide helps increase orders so you can turn down low-fee AMC work, negotiate fees from a position of strength and confidence and refuse to work for the AMCs that under value you with low-fee work and endless streams of unnecessary corrections and stipulations. Visit WorkingRE.com to order or email your request to subscription@workingre.com. Corporate Savings is a little-known but significant cost-saving benefit of being an OREP Member/Paid Working RE Subscriber. Members and Subscribers who take advantage of the program save money with Office Depot, Staples, Dell, FedEx, UPS, Spring, Travel, and more. OREP/Working RE saves well over $1,000 a year on office supplies alone. Rod Lopez, an appraiser from New Jersey, says that he saved over $100 recently on the discounts at Staples, Office Depot and on approved continuing education from Mckissock. If you’re an OREP member, ask about these savings! If you buy your insurance elsewhere, consider a paid subscription to Working RE magazine. Subscription benefits also include corporate savings, discounts on continuing education and more, in addition to the print magazine. The savings easily pay for the cost of the subscription.